With their own courts behind the Cranmer Arms, Aslockton is very fortunate to have this facility for all to enjoy. At Aslockton we are proud of our 2 all-weather courts situated behind the Cranmer Arms Public House on Main Street, NG13 9AL. A small group of members ensure these are maintained to a high standard at all times. 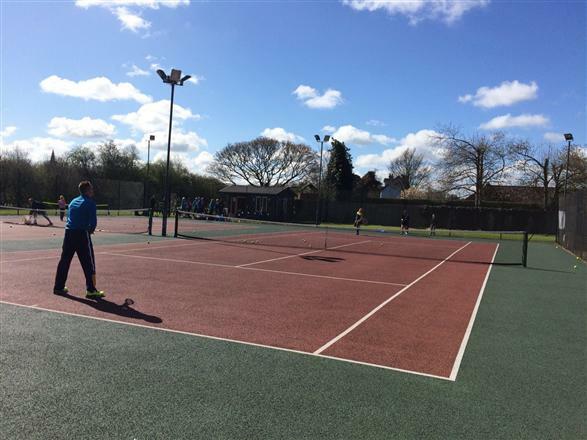 Since the club’s inception 25+ years ago the emphasis has been on social tennis, with players of various standards always welcome. The membership is made up of people from Aslockton and the surrounding area. As we’d like to attract new members, from 1 September 2018 to 31 March 2019 we are offering a special trial membership of £25 for seniors and £5 for juniors in full time education. Members’ children age 11 and under can play for free. This covers everything, including use of the floodlights. There is coaching available and sessions when anyone, of all abilities, can join in. Or email aslocktontennisclub@outlook.com, or if you prefer the telephone, phone Diane Sharpe 01949 850775 or Pauline Davidson 01949 850820. W.A.G.S. came about several years ago when as a group, we left the Womens Institute. The W.I. had become increasingly expensive, too formal, we were bound by too many rules and we had very little say over what we could do with our own groups money. However we enjoyed the company and support that our monthly meetings offered so we decided to “fly solo”. We have never had a formal committee, the only “official” is our treasurer who is in fact the husband of one of our members. Our aim has always been that everyone contributes to the meetings in whatever way they can, when they can and that can be suggesting ideas for meetings, making a cake, washing up, giving someone a lift to the hall etc. All money raised through subs. and the monthly entrance charge goes back to the members. Membership stands at just over 20 this year. Our subs are set to increase to £20 p.a. from next May which is the first increase we`ve had to make since we started. This increase is necessary so that we can continue to book good speakers and we now use the main hall rather than the Harris room so our overheads have gone up. Meetings are held at the Jubilee Hall, Whatton on the fourth Monday of the month (unless that coincides with a Bank Holiday when it`s the third Monday). We start at 2p.m. and finish at about 4p.m. We sit round tables, not in rows. Our calendar is a mixture of speakers and “home grown” entertainment—our own version of “Desert Island Discs” proving to be one of the most popular meetings thus far. We have a great variety of speakers and aim for the light-hearted and entertaining—it is after all an afternoon out. Talks usually last about an hour then we have tea/coffee and homemade cake and draw the raffle. We are a very friendly group and would welcome any lady who would like to join us. You can come and see what we`re all about with no commitment to join---£2 payable at the door. One or two of our meetings are for members only so please check our calendar first. 14th June 2018 Outing to Royal Crown Derby leaving at 9.30 a.m.